The house was built in 1867 as a silk-weaving mill. Since the year 1905 its owner was Hubert Gotzes and he had a very good reputation all over the world. 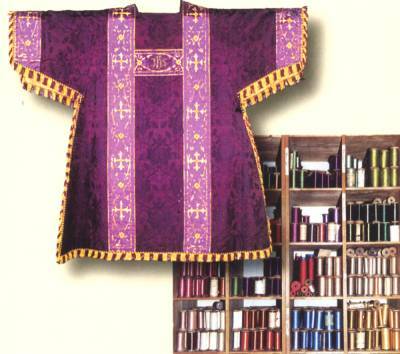 Up to the year 1990 from the simple Stole to the bishops chasubles, all the needs of clergy was produced here. In march 2000 the mill passed over without alterations into a beneficial association which acquired it with the help of some grants. In this house exhibitions are shown as well as the demonstration of weaving techniques, weaving implements and the fabrics of 200 years production.